We sell directly to chocolate makers of all sizes. Our smallest unit of sale is 70kg and can accommodate much larger orders depending on the needs of our customers. If you are interested in placing an order with us, please contact either Charles or Russell directly. We can walk you through the order process and address any questions you might have but most of your questions should be answered in the FAQ section below. If you haven’t already tasted our beans, you can order a sample from us here.While we are still a small operation ourselves, we strive to make sampling and ordering of larger lots a simple process. If you have any questions along the way, please don’t hesitate to contact us directly here. Flavor Notes: walnut, caramel, and tart cherry. Low acidity. Low tannin. Where are your beans from? Our passions for cacao, wildlife conservation, and sustainable development unite at Reserva Zorzal — a 1,019 acre bird sanctuary and organic cacao farm in the northern mountain range of the Dominican Republic. As our farm grows, we continue to plant new varietals based on feedback from international leaders in the artisan chocolate market. In conjunction with our Zorzal Estate beans, our Zorzal Comunitario beans are sourced from agricultural partnerships with a hand-picked group of farmers bordering the Zorzal Reserve and bird sanctuary. 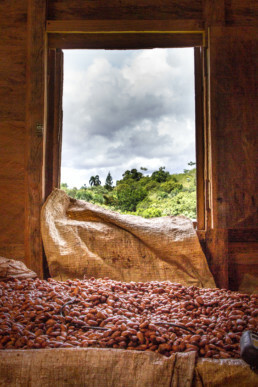 Both Zorzal Estate and Zorzal Comunitario cacao beans are fermented and dried at the Zorzal Fermentorium in San Francisco de Macoris. Where are your beans stored? Our beans are stored in specialty warehouses in New Jersey and California. When does Zorzal get new shipments? We ship beans to the US twice a year following our summer (May/June) and winter (Nov/Dec) harvests. We typically have beans ready for shipment by August and February, respectively. While we do our best to keep beans in stock we tend to sell out quickly each season. Zorzal Cacao is offered on a first come first served basis and generally sold well in advance of arrival into the US. For this reason, we encourage interested buyers to provide us with their orders shortly after sampling our beans and well before you actually need the beans for production. Can I reserve beans for the future? Yes! In fact, we suggest you do as we’ve sold out for the last four years straight. Can I sample your beans before making a purchase? Absolutely! Please click here for a link to our sample page. We are happy to send you a free sample, we just ask that you pay for shipping (max order 2kg). How much do you charge per/kg? Zorzal Cacao prices vary by year, origin and volume purchased. Please send us a note here describing your volume, timing needs, and any other details that you’d like to convey about your interest. What is your minimum order volume? We love selling our beans to small and large chocolate makers! Our smallest unit of sale is 70kgs (though we recommend you buy more—almost everyone does!). We are happy to arrange shipping for you or you can arrange it yourself. We will provide you with a shipping quote and include that in the price of your order. We do! However, please know that we charge a 3% processing fee for buyers who choose this option. Encouraging burgeoning artisan chocolate makers is part of our ethos. If you need payment terms, please reach out and let’s talk. Do you ship beans outside of the United States? We are happy to ship our cacao internationally and can provide the necessary documentation (phytosanitary certificates, certificates of origin, etc). However, please note that you will be responsible for organizing the shipping from our US warehouse on international orders. We are happy to provide you with recommended logistics providers to make this process easy. What happens if the bags or beans are damaged in transit? All orders are shipped on pallets and wrapped such that they are rarely damaged in transit. On occasion bags have been torn open while in transit, which is out of our control. If our cacao or the bags holding them arrive damaged or under weight, you must notify us of the damage, with appropriate documentation (i.e., photos, scale weight, etc) before you indicate acceptance of the the delivery from the shipping company. Once you notify the shipping company, please notify your Zorzal Cacao contact ASAP so that we can initiate a claims process with our insurance and/or the transport company.